The Israeli Dimona nuclear reactor complex. Photographed by Corona satellite on 11 November 1968. The Special National Intelligence Estimate, “Prospects for Further Proliferation of Nuclear Weapons” was originally obtained and posted by Archive analysts Jeffery Richelson and Bill Burr. The SNIE was produced after the somewhat unanticipated 1974 Indian “peaceful nuclear explosion” and attempted to estimate the future likelihood that “candidates for the development of nuclear weapons” (including Israel, Taiwan, Japan, Argentina, South Africa, and others) would produce nuclear arsenals. 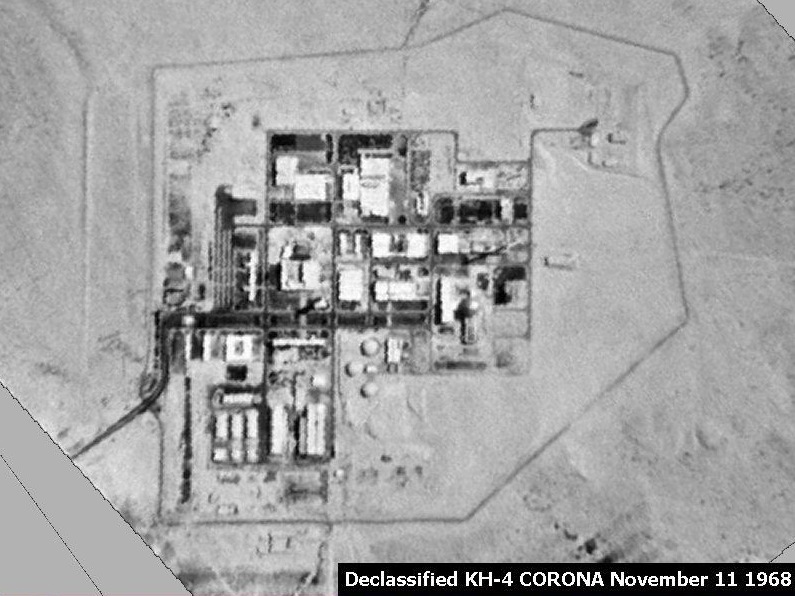 It has long been speculated that Israel maintained a nuclear weapons program. A 1999 Defense Intelligence Agency Report estimated that Israel had 60 to 80 nuclear weapons in 1999 and would have 65 to 85 by 2020. Israel, like nuclear-armed India and Pakistan, has not signed the nuclear Non-Proliferation Treaty. In addition to reporting the CIA’s take on Israel’s nuclear weapons program, this 1974 SNIE also warned of the further “spread of nuclear weapons,” of terrorist theft of weapons or fissile materials, and of the “acquisition of nuclear weapons by non-governmental entities.” 35 years later, these threats remain. Hopefully, President Obama’s Nuclear Security Summit will make headway confronting them. Had trouble opening that PDF file… wouldn’t do it for me. I’m wondering if the file is correctly cited. I’d love to read it! Now it also appears that Iran is attempting to develop nuclear weapons. Not a good direction. Note that the CIA’s version of this file (just the summary) on their FOIA website is almost entirely blacked out. Even though the summary (first five pages or so, including the line about Israel, with the exception of one paragraph) has been a matter of public record since it was included as part of Senate hearings in 1978. Citation: Hearings before the Committee on Governmental Affairs, United States Senate, 95th Congress, 2nd Session (23, 25, 27, 30 January 1978; 22 February 1978; 22, 28 March 1978), on page 719.